When I cast on for this top I was so in love with it. Almost immediately though, the s-l-o-w 4ply rounds almost did my head in. It was saved by a Big Knitting Day at Inner City Guild which included a train trip - where I was able to get a good many straight hours into it and feel like I was making some headway into the body. The divide for the sleeves came at a time where I was still 'in like' with it. Strangely, the yoke section seemed to take longer than the entire body section, no more knitting in the round. 'In like' was moving on to 'goodnatured tolerance'. Measuring the correct depth of the armholes was a little tricky, because one side has a buttonband which means that you don't knit the two the same depth. By this stage I was no longer feeling the love. And then, just when I thought I was on the home stretch, there was 18cm of ribbing for the collar. I plugged away; cursing, twitterwhingeing, stretching it to measure and wishing the days away. In the end, I succumbed to the Yarn Harlot theory of rib (which Kylie told me of) - I knit until I could not stand it any longer, and that's how I knew it was long enough. At this stage I was not in love with the top any longer. However, since blocking and pressing and trying it on, it's growing on me again. I am particularly pleased with the three needle bind-off shoulder, and the poker straight sewn on buttonhole placket on the sleeve. So now we're heading into MARCH (does time speed up when you're over 40 or what?) - where I will knit nothing but accessories. I'm urgently in need of some no-brainer knitting. It really looks fantastic. Stocking stitch and Rib can be mind-numbing but you did brilliantly. I think that amount of ribbing is just right! And the color is very now, according to The Sartorialist - it's what all the fashionistas are wearing, especially paired with petrol/ teal/ peacock/ mallard blues. I'm so glad you like it "again" because it would be a shame to do all that knitting and then not like. I shall put my sunnies on when I'm in your presence so I don't get blinded by all those rays of sunshine coming my way ;D ...fab colour ! goddamn that looks good!! gorgeous yarn, great design, and so well finished, as always. and yay for accessories month! Envy. Sheer envy. 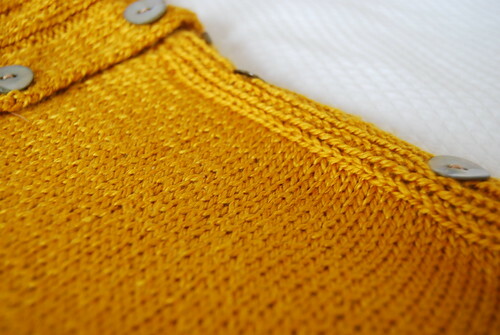 I just know I would never have the patience to knit a 4 ply garment, and I love them so much. I agree with Rosered - such a fashionable colour. 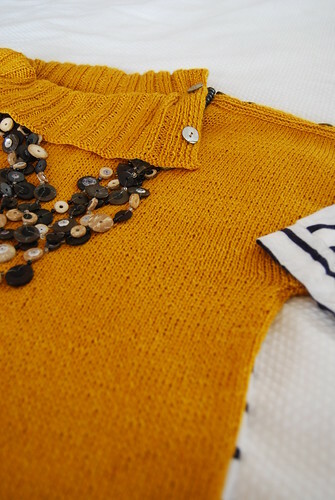 It looks great and I can just imagine how long it took to knit in 4 ply but the end result is worth it. I love the color too! Love it!, the colour is gorgeous and the execution sublime. oh you've done well (of course). Such fine attention to detail. Perfect execution! But it's Beautiful! And what a glorious colour. 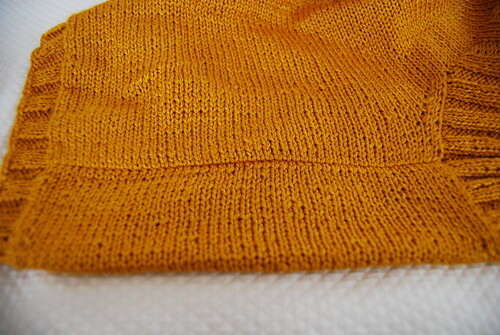 I think that it was EZ who said that about the ribbing (it is still a very fine piece of advice). Looks gorgeous & I am sure it's worth all the effort. 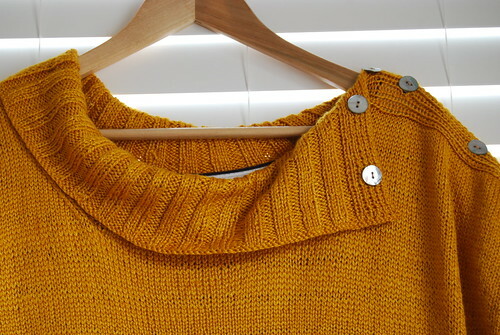 What pattern did you use for this sweater? I love it!